Scottish 16-year-olds and 17-year-olds can vote in the upcoming referendum on Scotland disbanding from the United Kingdom. The Scottish nationalist leader, Alex Salmond, secured this option, believing 16 and 17-year-olds favor independence. Reuters news reports England considered this a large concession. There were other compromises as well, such as England demanding a single yes/no vote rather than a second question about partial independence, requested by Scotland leaders. Regardless of the outcome, hopefully the new voters retain their voting rights in future referendums and elections. It appears there’s already a movement to give them this freedom. In Washington, DC, activists recently demanded a lower voting age and abolishing voter ID laws. At the event, National Youth Rights Association Executive Director Bill Bystricky said, “While no nation has ever been perfect in honoring that democratic ideal, America has a proud history of always moving closer to that goal, enfranchising new groups of Americans and expanding democracy. Today we are here to help move America another step forward.” He means another step closer to Scotland, a new role model for the US. In the US, things may move in the wrong direction, as President Obama wants to force 16 and 17-year-old to remain in government “schools” until they’re 18 or they graduate. Maybe he’s upset young voters are leaning libertarian. The Libertarian Party’s platform doesn’t mention the voting age…yet. 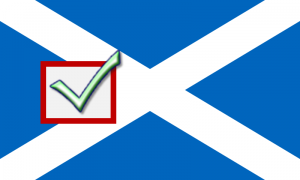 Read about the Scottish vote.